(Nanowerk News) In a novel test of Einstein’s theory of general relativity, an international group of astronomers has demonstrated that the theory holds up, even for a massive three-star system. Einstein’s theory states that all objects fall the same way despite their mass or composition, like a cannonball and apple falling off the Leaning Tower of Pisa and hitting the ground at the same time. While this theory works in many situations, others hypothesize there are circumstances when alternative theories of gravity would be at play, such as in instances of extreme gravity. New research published in Nature ("Universality of free fall from the orbital motion of a pulsar in a stellar triple system") confirms that, even in an extreme gravity system, the theory of relativity still applies. “This research shows how routine and careful observation of distant stars can give us a high-precision test of one of the fundamental theories of physics,” said Ingrid Stairs, professor in the department of physics and astronomy at UBC and a co-author of the study. 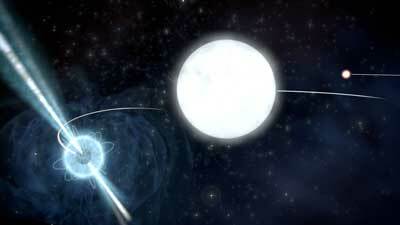 After discovering the three-star system, the researchers published a study in Nature in 2014 ("A millisecond pulsar in a stellar triple system"), which noted that the system could be used to test Einstein’s theory. The team of astronomers followed the neutron star for six years using the Westerbork Synthesis Radio Telescope in the Netherlands, the Green Bank Telescope in West Virginia and the Arecibo Observatory in Puerto Rico.